Unfortunately, that's not a headline from 1913, it's from something that happened today. A woman was killed and three others injured when the Ford Model T they were riding in crashed near Utah's Zion National Park. Utah's Deseret News reports that the 1915 Model T carrying four people pulled over to let traffic that had built up behind it pass on state Route 9 around 10:20 a.m. today. Investigators believe that as the driver tried to get the car back onto the pavement, he failed to negotiate the slope properly and the T's wooden tire spokes collapsed, causing it to overturn and eject all four occupants. Karen Johnson, 51 of Minnesota, later died at a hospital, the newspaper reports. Among the injured were the driver, Johnson's son, and her 12-year-old granddaughter. They were not seriously injured. 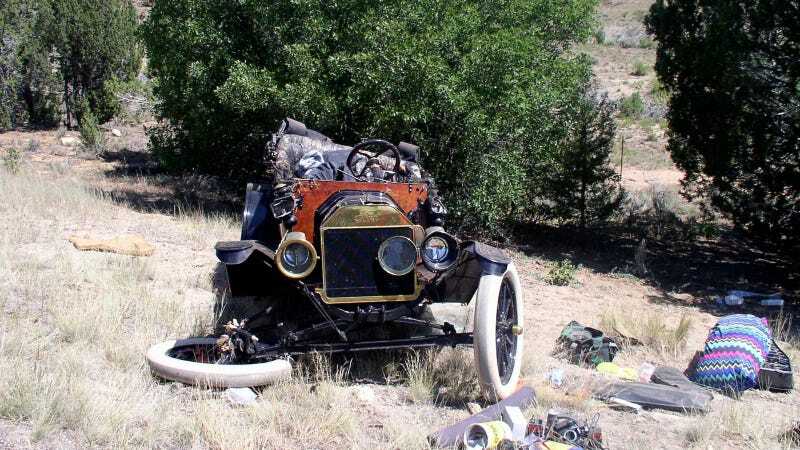 This crash occurred during a national Model T club that was meeting in Kanab with more than 200 owners in the area for the week. Needless to say, this is the last thing that any group of car enthusiasts wants to happen when they get together. Our condolences go out to these families and their friends.